Inge Oskam (1970) studied Industrial Design Engineering at Delft Technical University. Further she followed several courses in the area of project management, a management course at Vlerick Leuven Gent Management School and an expert training for facilitator of creative thinking processes at COCD. Recently she finished a professional development programm in change management at Sioo. 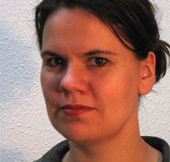 From 1994 to 2002 Inge worked for TNO Product Centre in Delft and for TNO Industry in Eindhoven. As a project manager at TNO she gained experience with concept development and system design of innovative products and with creating collaborations for realising innovative leaps. The last three years at TNO she concentrated on the development of tools and methods for product innovation and she grew into consultancy in innovation management. In 2002 she started buro io to support organisations in a more personal way with management and organisation of innovation. Her working method is characterised by an analytical and creative approach and a pragmatic use of tools and methods. Her passion is building bridges between marketing and R&D and helping organisations to develop more innovative power. Since the 2007 Inge is also part time research professor Technical Innovation & Entrepreneurship at The Hogeschool van Amsterdam, University of Applied Sciences (HvA), school of Technology.